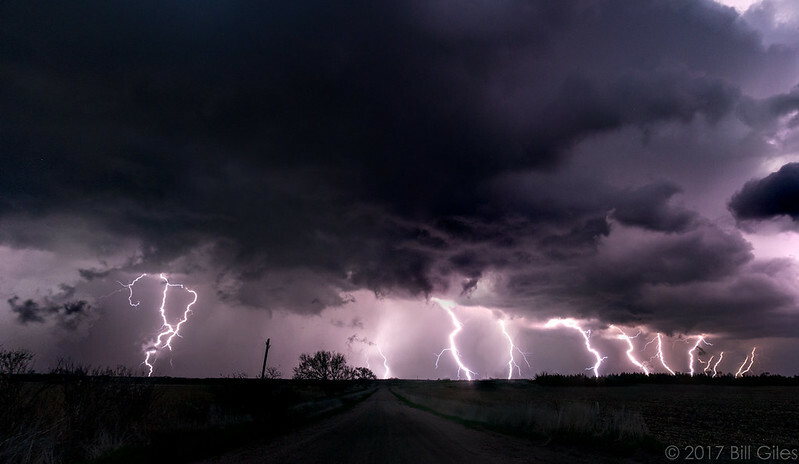 I want to see tornadoes. I don’t want to drive to Nebraska. There’s two targets today; Nebraska or Texas. Texas adds two hours of drive time just to get there. Besides it’s looking like southwest Nebraska is the area to be. Not too bad a drive. The night before I’d talked myself out of it. The next morning I was waffling and going over models. After I made breakfast I was fidgeting. By 10:30 I was packing the car. I left an hour later. NOTE: This will be an odd post because I’m going to cover two things: the actual chase and (sort of) a camera review. I’ll tackle the chase first. My initial target was McCook, Nebraska, although by the time I hit Atwood I was already thinking I’d need to be further west. I was also hungry and couldn’t find anywhere quick to eat. Sheer hunger drove me onward to my original target and I’m glad it did, because as it turned out storm initiation ended up being further east than I’d thought. I grabbed McDonald’s in McCook (McSymmetry!) and immediately started for Holdrage, changing my mind at Arapahoe and turning north instead to position for the storms I knew I could catch. 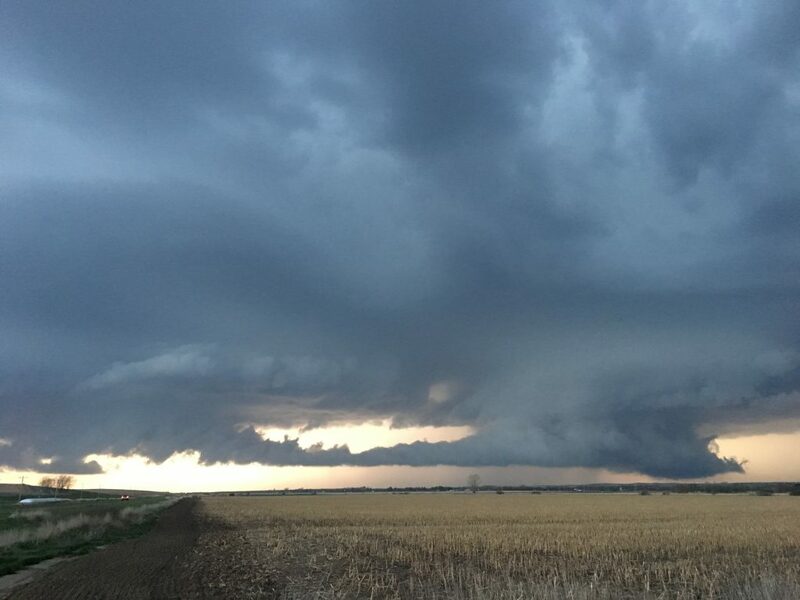 I was a little unhappy with how my chase had gone from southwest Nebraska to almost central Nebraska but hey, if you want to see the storms you go where they go. Just north of Arapahoe, I took this shot of my initial target. By the time I got close enough, the original cell I’d targeted had weakened and no longer looked that inviting. I had towers going up to my west that might work, although I thought the structure looked pretty elevated. I’d already given up on tornadoes for the day, but since I was losing light I decided to position for these new storms instead and try to score some backlit sunset photos. I made my way up to I-80 and went east, stopping just west of Elm Creek. …except my brain malfunctioned and I forgot how to photograph stuff in low light. I haven’t been in the field for months, other than the occasional sunset trip. No lightning to practice on. For some reason I decided I needed to keep cranking my ISO up instead of setting up on a tripod and lowering shutter speeds. 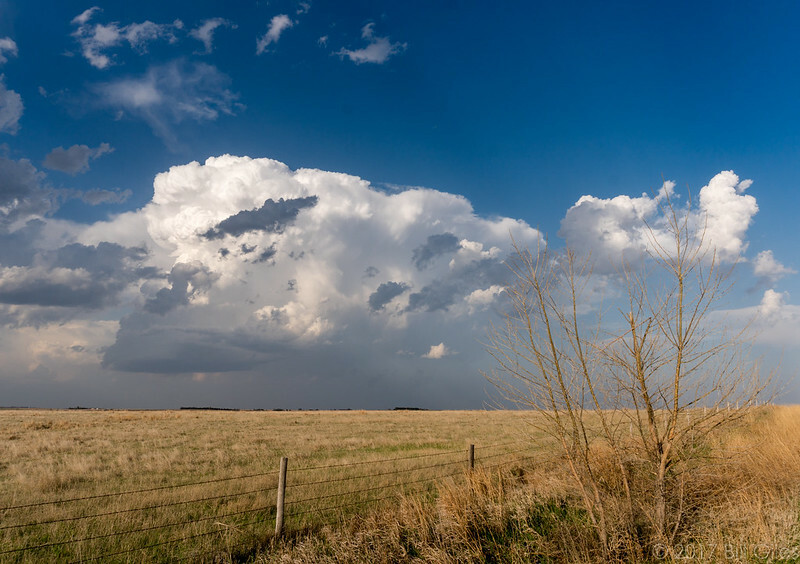 I missed some great shots with my primary camera, including two supercells with very pronounced lowerings (possibly wall clouds but with the light I couldn’t verify rotation) the southern cell clearly cannibalizing moisture from the one ahead. I’ve got pictures, but they’re grainy and I don’t like them. Funny enough, I did sort of get it with the a6300 camera. The storm on the left was clearly leeching off the one to the right. Convective mooching, as it were. This is an iPhone 6s picture, by the way. Both storms also started dumping out a ton of half dollar sized hail, which enforced my decision to stay put. While I was sitting there dealing with nonsense camcorder issues (more on that later), a local spotter named Ashley drove up and parked next to me. She told me that she’d just come through the hail core. In her very nice looking Dodge Challenger. I wouldn’t have done that in that car. Dedication! We talked for a few minutes and as she was leaving she mentioned something about her phone (her only camera on her) and how she wished she could catch some of this great lightning. ….hey, yeah. There IS some great lightning. Man, where was my brain today. I finally dug out the tripod and stayed for another full hour. Around 9:00PM (Central Time) I decided to head for home. 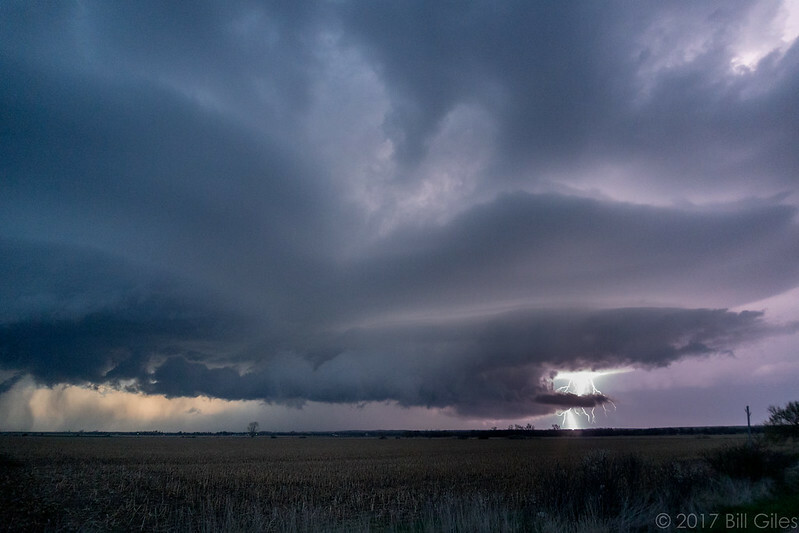 I’d been in contact off and on with Tara Kiehn throughout the evening about possibly chasing together the next day. It turned out that it probably wasn’t going to work out, since I got home around 2:30AM and was a zombie for half the next day. All in all, it was an extra 91 miles driven from McCook to Elm Creek, making for about 802 miles total for this chase. It’s always just a little further. My target was reasonably close to home, although some people might laugh at a five hour, one way trip being “a close chase”. I was willing to chase just about anything at this point, including a forest fire if it looked sufficiently cloudy. I was going to test out a new toy. The Sony FDR-X3000. I bought the one without the little monitor. That monitor option adds ~$120 to the price. I’m a big fan of equipment that can perform multiple tasks. In this case I wanted a dashcam for standard driving timelapses and recording storm intercepts, but also have the option to take it off the dash mount and put it on a tripod for outdoor work. Usually this means going with what most storm chasers go with, an actual camcorder or a DSLR camera. That’s a little more costly, and I thought there might be a happy medium between the two – the action camcorder. What’s an action camcorder? Well, think GoPro. Tiny little rugged cameras you can attach to all sorts of things. In recent years the big names in camera equipment have started to respond with their own versions. Nikon, Sony, and others all have their own products, but the one that caught my eye was the Sony X3000. I didn’t need to buy any additional mounting hardware, and I liked the picture and color quality of the footage I saw. What was I after in a camcorder? Here’s the list. Focusing. Whatever I buy needs to either be a fixed focus camcorder, or must be able to manually focus to infinity and stay that way. This was my main problem with my current setup. Finding out half your tornado footage is blurry is heartbreaking. 4K video. I wanted the option to record in 4K. For normal driving around, HD would be just fine, but when storms start firing up I wanted the option to switch to a larger resolution. No overheating! Right now I have to point an AC vent at my cell phone dashcam to prevent it from overheating. It’s worked so far but I can’t be doing good things to that poor phone. Large storage. It needs to be capable of handling a large memory card, like 128GB or 256GB. I don’t want to be messing with this device once it’s on and recording, other than moving it from one place to another. Affordable. The Sony X3000 retails for about $400, cheaper than most 4k camcorders. So I bought one, and I bought a Goby windshield mount and a little action mount adapter that I didn’t really need, yet somehow ended up being useful. Focusing – No problems there. It was cool and a little surreal to have both the clouds and the sad remains of 2-3 bugs all in focus. Apparently I need to wash the windshield more carefully with this camcorder. Audio – Also no real problems. It sounds pretty good and has some built-in wind noise reductions. Of course, in these storms that isn’t going to matter, but there’s an external microphone jack built into it where you could plug in a quality microphone with some real wind reduction options. Storage – Fits what I need perfectly. It took my 64GB micro-SD card and told me it could record just slightly over two hours of 4K footage at 30FPS, 60MB. So the only problem here is that I need a larger card. These are the problems you want to have. Steadyshot – I was REALLY impressed with the Sony Steadyshot functionality. The Goby windshield mount displayed some vibration with the camera on it while I was driving, but you can hardly tell in the footage. At least I couldn’t. Side note: The ultra-wide lens – This ended up being a pro and a con, funny enough. I had a hard time getting this camcorder to show only the road and the sky, and not the windshield frame. I ended up pointing the camera much higher up then I thought made sense but it worked out alright. Still, you can see the reflection of my dashboard in the footage, which I could probably fix by covering the dash with a piece of dark fabric. However, the ultra-wide lens creates that bubble effect on the landscape which is usually just a minor distraction or affectation, unless you accidentally move the camera sideways or park on an incline, then it’s really noticeable. Such as in the last video clip I uploaded. Yeah, I can fix it on post-processing, but in Vegas it’s a pretty manual chore and just adds time to the editing process. First problem: Overheating. This thing overheated on me three times during the chase, and when it does it stops recording. The first time was just after 15 minutes! In retrospect I should have known better – the camera’s form factor is tiny and that heat probably can’t escape efficiently. I think they’re counting on your movement and the associated breeze to cool it. I had it stuck on a windshield with the sun beating down on it, so it didn’t have a chance. Even pointing the AC at it didn’t seem to help. This was the deciding factor to return it. Next problem: Ease of use. In order to get the camcorder to work well for the dash, I had to attach the dash mount as high as I could on the windshield, then hang the camera upside down and tell it to flip the recording upside down. There is a setting for this, so that’s no problem. The problem came in when I wanted to take the camera off the dash mount and put it on a tripod. Remember, it’s recording upside down, and now I want to put it right side up and attach it to the tripod. So you need to stop it and go into the settings to flip the recording (which are tiny little pictures on a small grey LCD screen and minimal text). This is time I usually do not have when I’m on a storm. The X3000 has built-in Wifi and can connect to a tablet or smartphone, where you can monitor the recording and change camcorder settings. This worked about 50% of the time. Oftentimes the android phone I was using couldn’t connect to the camcorder at all. I tried just leaving it synced and it overheated even more quickly after that, which makes me think that the extra power usage from the built-in wifi contributed to the camera overheating faster. Also if I moved the camera outside, then back in to the dash mount, I had no way to see if I’d bumped the windshield mount and changed the framing. Unless I grabbed the phone and tried to connect to the camera and check. Again, I just don’t have that kind of time when things are happening so that pretty much killed the versatility. I could fix this with a more rugged (and therefore more expensive) windshield mount, but it sort of defeats the purpose of cost savings. As is, It’s a dashcam, or a handheld/tripod camera…but not both. Not in a timely manner anyway. I’d also hoped that low light functionality would be better since the Sony sensors have a very good reputation for that, but I thought it was pretty grainy. No good way to manually lower ISO either. Last problem: Charging. You can’t charge the camcorder in it’s waterproof case, so I couldn’t use that ever. I figured as much. But at some point I plugged it in to charge (it devours the battery when recording) and it didn’t seat right so it didn’t charge. This led to the camera dying while out on the tripod after only five minutes during the best storm structure. I thought it was another overheat at first. Nope! Well, I hoped for the best but it just didn’t work out. It’s a good little camcorder and I’m sure it works well for it’s primary task. You could buy one, strap it on your bike handlebars or a helmet and go on a ride or run and I’m sure it would do its job just fine, storage and ambient heat permitting. Maybe if I was braver and stuck it on the outside of the car it might have kept cool, but I’d have to buy a handful of batteries to feed it and a larger memory stick would definitely be required. For what I wanted though, it’s not going to work. It turns out you forget things when you don’t chase for 8 months. I need to make sure my photography notes are available offline so I can reference them in the field. 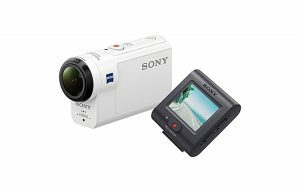 The Sony FDR-X3000 is not the camera for me. At least, not for what I want. If you start a interesting new podcast right before a chase, remember to download the other episodes before you leave home. Replenish my snacks (on the healthy side) or eat before you need to. I think this chase will go down as one of my…hungriest? I ended up eating Taco Bell around 1:30AM at Sterling, CO. I also ended up wearing most of a taco just outside of Sterling. Anyone got advice for removing grease stains from denim? Cotton? My seat belt?